SWIMMING: It was a weekend full of bling for Gladstone Gladiators Swimming Club athletes at the Fairymead Winter Short Course in Bundaberg. The club collected 20 gold, nine silver and 13 bronze medals across the two days of competition. Gladiators head coach Tom Fronek could not commend his swimmers enough. "There is a great sense of team pride and camaraderie amongst our swimmers," he said. "Most have focused on only three or four events so they are really quite relaxed and enjoying it." Shianne Plunkett took out Age Champion in the 11-year-old girls' division and Adela Kracizova, who is training with the Gladiators in her visit from the Czech Republic, did the same in the 15-year girls. 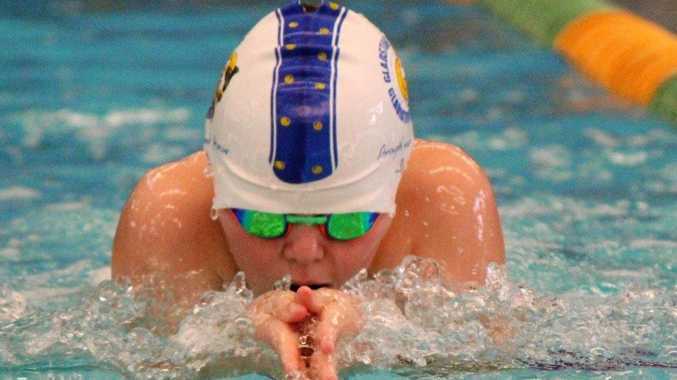 Shianne also broke the record for the 25-metre freestyle in her age group and finished with three gold medals while Kai and Jake Devine won three and one gold medal respectively. The first day saw Gladiator gold won by Kane Martin and Adela with three, and Cyrena Dixon and Shianne with two gold medals apiece. Sisters Brooke, Reagan and Rhiannon Copsey also snared a gold medal each.